ORCA Brigade leader Maximillian Thermidor’s personal NEXT is the next (pun definitely not intended) Armored Core to be immortalized in plastic model form, courtesy of model maker Kotobukiya. 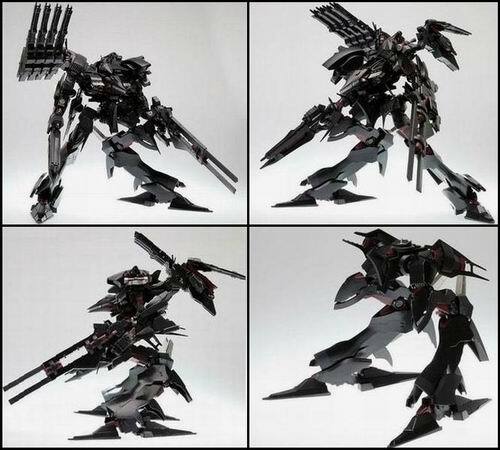 This kit is the twenty-seventh model to be produced for the Variable Infinity series, joining the likes of Supplice, White Glint and Noblesse Oblige from the Playstation 3 Armored Core games. Thermidor’s Rayleonard-based NEXT consists of most of the standard AALIYAH frame mounted on a pair of reverse-jointed ALICIA legs, the first RJs created so far in plamo form. Weapons include the MARVE assault rifle and the TRESOR plasma cannon, among others No shoulder parts on this one although it does come with a pair of leg-mounted stabilizers. Unsung will be ready to fly the banners of ORCA and oppose the League’s plans when it hits store shelves this coming January, 2010. Arrr, that’s one typo that slipped the net. At least it’s not as epic as some of Raffy’s lines. Hahaha want me to put (pun not intended) there? :P It’s not what I’d call a typo though. Just an amusing line.